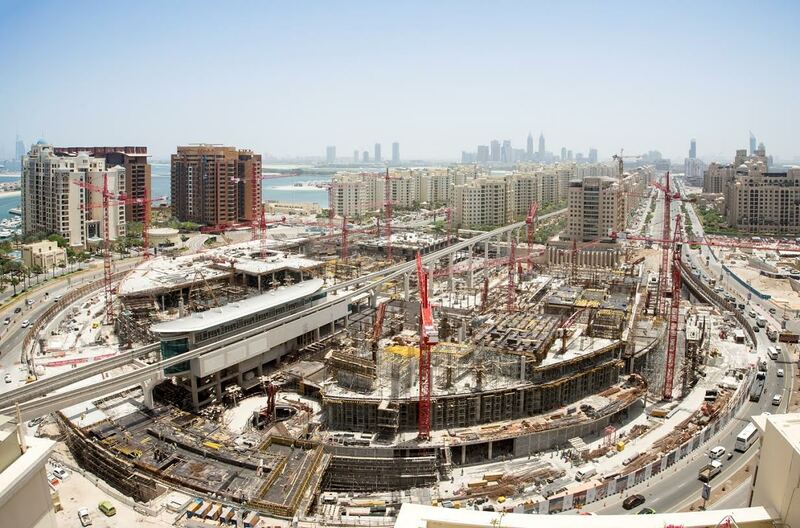 Nakheel, Dubai-based developer, has said that Dh1.2 billion, 4.5 million square foot Nakheel Mall on Palm Jumeirah is nearing 50 per cent completion. The mall’s three underground parking levels, with 4,000 spaces, are nearly complete, with the overall superstructure due to be finished in the third quarter of 2016. Work is also on track on the mall’s VIP entrance and rooftop features, which include two fountains and two waterfalls plunging as far as 65 feet into the mall, the developer said in a statement. The mall will have five retail levels with 350 shops, restaurants and leisure attractions spread across 1.2 million square foot of leasable space. Nearly 60 per cent of shop space has been booked. The statement did not give any opening date. Next to the mall will be The Palm Tower – a five-star, 52-storey hotel and residential complex – for which a separate construction contract was awarded in 2015. A St Regis hotel will occupy the first 18 floors, with 504 residences above. Due for completion in 2018, the tower will also boast a trio of rooftop attractions, with an infinity pool on the 50th floor, a 51st floor restaurant and a viewing deck, 220 metres above ground, on level 52.